PayAnywhere's card reader is one of the smallest on the market. With PayAnywhere’s free card reader and app for iOS 4.0+ devices, Android 2.1+ phones (but not tablets), and BlackBerry 4.7+ devices, you can accept Visa, MasterCard, American Express, and Discover cards with a transaction fee of 2.69 percent per swipe. Keyed-in transactions are subject to a fee of 3.49 percent plus 19 cents. In addition to performing regular charges, you can perform preauthorizations, forced transactions, voids, and full or partial refunds from either the app or the company’s website. You have the option to waive the customer’s signature if the charge amount is less than $25. PayAnywhere lets you accept and track cash payments, tips, and discounts, too. You can also send customized receipts to customers via email, but not by text message. For iOS devices, you can connect an AirPrint-enabled or Star thermal printer and a cash drawer. PayAnywhere's Android and iOS app has a convenient lock-out button. Of the four mobile payment card readers we reviewed, only the Square device was smaller than PayAnywhere’s. Although it is free to swivel as much as 45 degrees when plugged into a device, it moved only slightly when we swiped cards in our tests. The PayAnywhere website is easily the most impressive of the four services we tested. You can view transaction details (including the sale amount, tax, discount, and tip). You can also see graphs of your top sales days, produce a variety of custom reports, and set it up to send reports to you via email automatically. 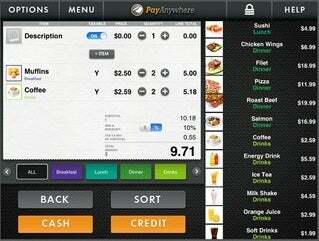 PayAnywhere’s iOS and Android apps are equally feature-rich and easy to use. One notable and convenient feature is a lock button that you can use to secure the app when you’re not actively using it. We did find a few areas that could use improvement, however: While the Android and iOS apps are relatively similar, the iPad version provides a better user interface because it takes full advantage of the larger screen, particularly when you're selecting items from menus as opposed to just typing a total for the transaction. Note: This review is part of a four-product roundup. You can read the introduction to the roundup here. PayAnywhere's system is a good choice if you're looking for a simple processor or even a POS-like system that supports cash drawers and can print receipts.